Line a cookie sheet with parchment, waxed paper, or a Silpat sheet; set aside. Then, melt about ¼ cup of chocolate wafers following package directions. Using the melted chocolate, “glue” 3 Minis together, using the photo as a guide. In the gap that is left, “glue” a Pretzel Stick for the stem. Repeat this process to make the amount of shamrocks needed. In a microwave-safe bowl, melt about 1/8 cup of the icing and 1 tsp. of water. Melt on high in 7 second intervals until the icing is pourable. 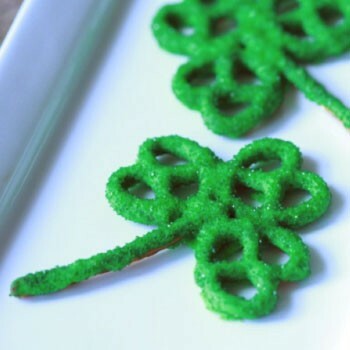 Pick a shamrock by the stem and hold over a bowl and pour the melted icing over the shamrock to coat; gently tap on side of bowl to remove any excess; place on lined cookie sheet; sprinkle with sugar crystals; repeat for other shamrocks.